Accelerate innovation and conquer complexity in artificial intelligence (AI), automation, autonomous vehicles (AVs), advanced driver-assistance systems (ADAS), machine learning, sensor fusion, unmanned platforms, and many other high-tech projects with Crystal Group RIA™ — the Crystal Group Rugged Intelligence Appliance. Put advanced projects on the fast track to market with Crystal Group RIA, designed specifically to reduce development time and streamline systems integration to speed past competitors. 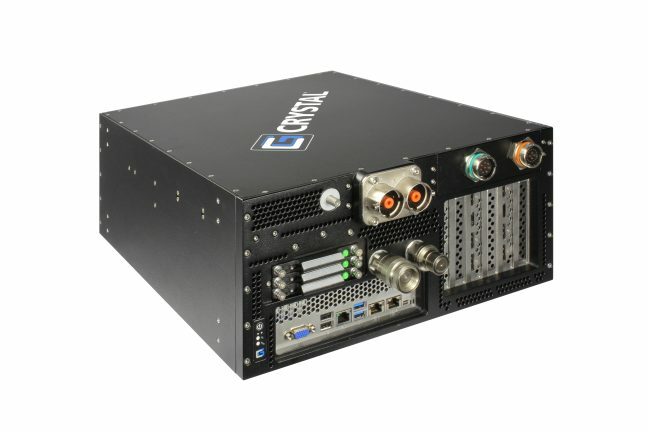 Crystal Group RIA combines impressive compute power, data-handling capabilities, and storage capacity in a compact, rugged solution that can withstand harsh conditions and environments – including potholes, collisions, and extreme temperatures that could cause traditional systems to fail. Available in custom or off-the-shelf configurations, Crystal Group RIA high-performance computers sport the latest Intel® processors, high-capacity DDR4 memory, and sophisticated power and thermal management stabilized in a size, weight, and power (SWaP)-optimized aluminum chassis. Jump-start your autonomous, automated, unmanned, or AI project today with Crystal Group RIA – available off-the-shelf or customized to specific requirements. Smarter with Intel®. Stronger with Crystal Group.